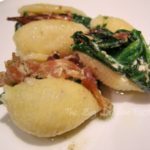 Pasta shells stuffed with prosciutto and spinach: Our recipe for pasta shells stuffed with prosciutto and spinach was developed as a test … and a jolly tasty one it turned out to be! 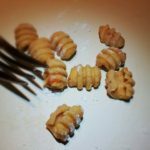 We had made some medium sized pasta shells, also known as ‘conchiglioni’, and as will all of our new pasta projects, had to test the cooking time. This time is then recorded and past on to you via our packaging and labeling. 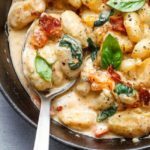 This recipe was so tasty we recorded the ingredients and promptly took a photograph of the resulting conchiglioni stuffed with proscuitto and spinach for you. Add the proscuitto and cook until crisp. Add the spinach and thyme to the proscuitto and cook until spinach shrinks. 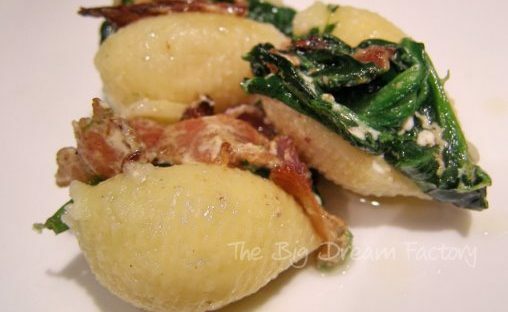 Mix the cream cheese with spinach and proscuitto. 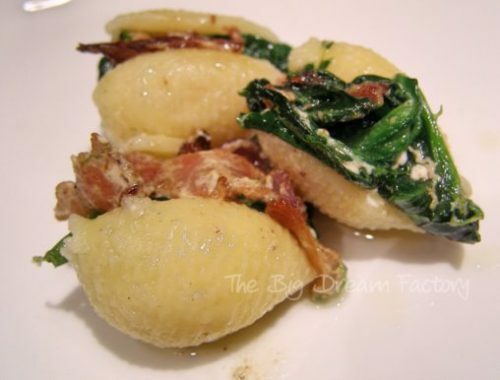 When the shells are cool enough to handle, stuff each one with a little spinach and proscuitto mix.